On February 11, in the morning, Israeli soldiers and police arrested one man on the bypass road (317) near the village of Tuwani in the South Hebron Hills, and then raided the nearby village of Jawwaya. The man who was arrested had obvious signs of violence, including blood and a scratch on his face, and was probably injured during the arrest. 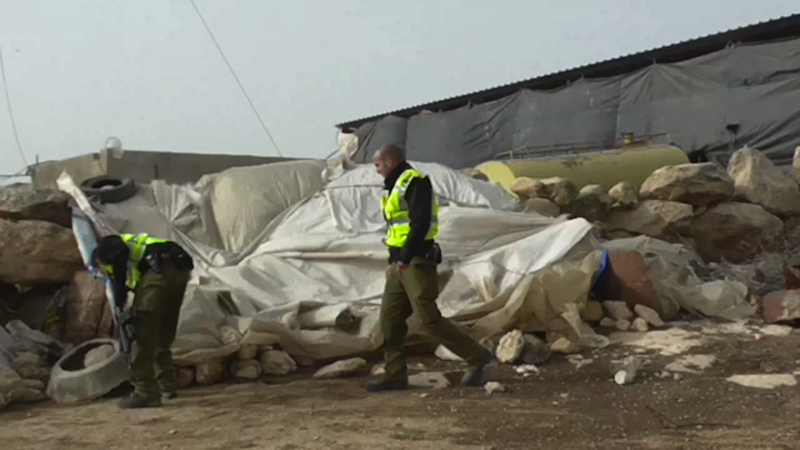 While this man was arrested on the road, Israeli army and police raided Jawayya, where they damaged a tent used by villagers for the storage of livestock food. 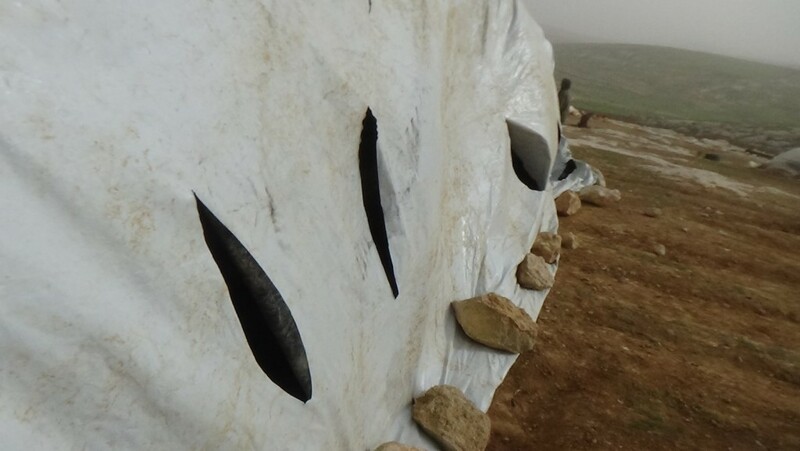 The soldiers slashed the walls of the tent, probably with a knife. Around 7:30 am, a family from Jawayya called international volunteers and told them that there were soldiers in Jawayya village. As the volunteers were walking to Jawwaya on the bypass road (317) they saw a police vehicle next to two other cars, which had damaged wheels and flat tires. When the volunteers arrived at the vehicles they saw one man on the ground near one of the vehicles at the side of the road. He was blindfolded and handcuffed with his hands behind his back, and he appeared to have been beaten on the face and mouth. The soldiers loaded the man into one of the vehicles with damaged tires and the soldiers then drove all of the vehicles away. At around 8:20 am, two international volunteers arrived in the village of Jawwaya, where Israeli soldiers and police were searching houses and tents, probably looking for another man. One of the soldiers attacked one of the volunteers, and then attempted to steal a camera from another. According to Palestinian witnesses, soldiers and police slashed large holes in a tent used as a shelter for the food for the animals and they fired shots into the sky in order to intimidate the inhabitants of the village. At about 8:45 am the soldiers and police left Jawwaya. On February 6, in the morning, Israeli soldiers arrested two Palestinian shepherds, one of them aged sixteen. The soldiers tried to arrest another Palestinian shepherd but villagers prevented the arrest by popular nonviolent action. At about 10:40 a.m. four Palestinian shepherds were grazing their flocks on Khelly valley, in the South Hebron Hills area village of At-Tuwani, when the security chief of the Ma’on settlement arrived and called the Israeli army to prevent the shepherds from using land that is the object of settlement expansion. At 10:55 a.m. an Israeli Army jeep arrived in Khelly area and the soldiers started to run after the shepherds. The shepherds, who are all young boys, were scared and began to run away. The soldiers caught one Palestinian shepherd and immobilized him on the ground. Meanwhile Palestinians from At-Tuwani reached the soldiers and, by a nonviolent popular action, freed the shepherds. The soldiers then drove after three of the shepherds as they moved their sheep back to their village. One shepherd was able to run away while the others two were prevented from leaving by the soldiers. At around 11:30 a.m. the soldiers put them inside the army jeep and drove away. At about 8 p.m. the Palestinians were released. Since the beginning of this year this is the fifth time that Palestinian shepherds have been harassed in the Khelly area. The Israeli administration declared Khelly valley a “closed military area” in September 2013, and it is the site of frequent threats and violence by Israeli settlers and Israeli armed forces. This valley is Palestinian property where the Palestinians continue to resist with their daily work, despite of all the restrictions. La mattina del 6 febbraio, soldati israeliani hanno arrestato due pastori palestinesi, di cui uno di sedici anni. I soldati hanno provato ad arrestare un altro pastore palestinese, ma gli abitanti del villaggio ne hanno impedito l’arresto con un’azione popolare nonviolenta. Verso le 10:40, mentre quattro pastori palestinesi stavano pascolando le loro greggi presso la valle di Khelly, nel villaggio di At Tuwani, il capo della sicurezza dell’insediamento di Ma’on, arrivato sul posto, ha chiamato l’esercito israeliano allo scopo di impedire ai pastori di utilizzare una terra che è oggetto di espansione dell’insediamento. Alle 10:55 una jeep dell’esercito israeliano è arrivata in Khelly e i soldati hanno iniziato a rincorrere i pastori. I pastori, tutti ragazzi giovani, spaventati, hanno cominciato a fuggire. I soldati ne hanno catturato uno e lo hanno immobilizzato a terra. Nel frattempo alcuni palestinesi di At-Tuwani hanno raggiunto i soldati e con un’azione popolare nonviolenta hanno liberato il pastore. I soldati hanno poi rincorso con la jeep gli altri tre pastori, mentre questi già guidavano le pecore verso il loro villaggio. Un pastore è riuscito a scappare, mentre agli altri due è stato impedito di andarsene dai soldati. Verso le 11:30 i soldati li hanno caricati dentro la jeep dell’esercito e si sono allontanati. Verso le 20:00 sono stati rilasciati. Dall’inizio di quest’anno, questa è la quinta volta che i pastori palestinesi sono stati attaccati in Khelly. L’amministrazione israeliana ha dichiarato la valle di Khelly una “zona militare chiusa” nel settembre del 2013 ed è il luogo di frequenti minacce e violenze da parte dei coloni israeliani e delle forze armate israeliane. Questa valle, di proprietà palestinese, è uno dei luoghi in cui i palestinesi continuano a resistere con il loro lavoro quotidiano, a dispetto di tutte le restrizioni.